Auto Industry Newsletter: Will Cummins ever integrate vertically? It is not unreasonable to think that 12 or 18 months ago, at least one Cummins senior executive might have mulled over the question in his mind in a quiet moment: Is it time for the company to integrate vertically? The company’s deeper involvement with Navistar International Corporation by providing SCR (selective catalytic reduction) technology as well as ISX engines to the Lisle, Illinois company, could have triggered such thoughts. Indeed it is possible the subject of embarking on talks with Navistar chief executive officer, Troy Clarke, about the company Columbus, Indiana taking a 25 per cent stake in Navistar may have been the subject of private discussions round the boardroom table in Columbus. The question might be asked: What’s the point of doing that? In exchange for capital, Cummins would then have at least two directors on the board of Navistar and to some extent would be in a position to assist/control Navistar’s engine development in attempt to make the beleaguered company healthier. After all, it has to be assumed that engine development was and is one of the weak aspects of Navistar’s business plan – otherwise it would not now be teaming up with Volkswagen AG. At the end of the day, Cummins’ principal activity is making engines. And selling engines not only to Navistar but to Daimler AG (Freightliner), Paccar and Volvo Truck which build trucks in North America. Navistar’s engine business is valuable to Cummins – Navistar is probably its largest customer. But taking a 25 per cent stake would not have given Cummins the control it perhaps wanted. Another possibility that could have been tossed around the boardroom table at Cummins could have been the prospect of making a full-scale bid for Navistar. That way it could, long-term perhaps, at least be assured of Navistar’s entire engine business by streamlining the two Huntsville, Alabama engine plants. And, in the process made a taken a serious bite out of Daimler’s market share leadership. The downside of such vertical integration can be found with Cummins’ other customers in the US – Freightliner, Paccar (which includes Daf, Kenworth, Peterbilt) and Volvo Truck (Mack). They would not be happy to see a principal engine supplier in effect acting as a competitor. 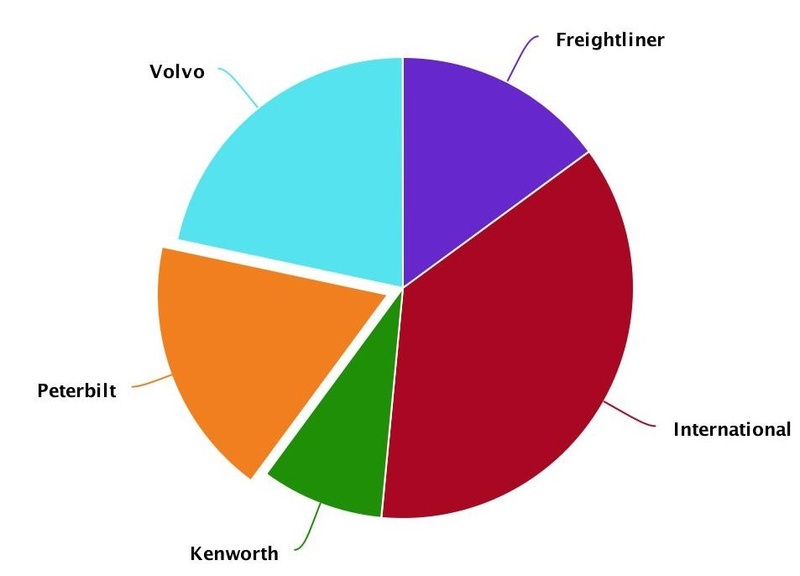 The chart below shows US truck manufacturers' market share in the first quarter of 2016. It is likely that as soon as Cummins took control of Navistar that Daimler, Paccar and Volvo would assess their powertrain purchasing decisions. Of course, it is the truckers – the private operators and the large companies – which in many cases determine which engine will go into which truck. So it is possible, such customers would stay with Cummins as engine supplier. On the other hand, the truckers could switch allegiance to Navistar (which would be good for the new owner Cummins Inc.) and source their trucks from the Lisle-based vendor. But it would be a gamble. If truckers did switch allegiance, it would be good news for Navistar (and Cummins) and bad news for Daimler, Paccar and Volvo Truck. Another downside of Cummins making a full-out bid for Navistar lies in the nature of truck builder. Cummins is not a truck builder – and never has been. Its executive would need to rely entirely on their counterparts at Navistar for truck manufacturing know-how. Navistar’s link with Volkswagen makes more sense in two ways: the German company not only brings diesel engine development and manufacturing expertise to the table; it can also give Navistar the benefit of its own heavy duty truck making units in Germany and Sweden, i.e. MAN and Scania. For Cummins Inc to have control of Navistar it would need to take a 51 per cent stake which would cost a significant $786 million! For VW, a 16.6 per cent stake costing $256 million is cheap at the price. In the light of all such uncertainties and implications, had the senior executives of Cummins mulled over the topic of vertical integration, it is conceivable there were just too many imponderables to make it worthwhile them taking the risk. They could not guarantee which way the dice would roll: a 1 or a 6. The answer to the question posed in your headline must be no. It's too late. The VW-Navistar deal means the chance has gone. It is certainly true that in North America, the medium- and heavy-duty truck buyer still has some choice on make of engine, to the extent that Daimler, Volvo and Paccar, under customer pressure, continue to offer Cummins power - primarily the X15. All three of them would dearly love to get rid of the Cummins option and become 100% vertically-integrated enginewise, with all the accompanying advantages of a wholly captive (and profitable) aftermarket in parts and service. But each of them knows that to drop it 'unilaterally' would risk losing customers to the other two. So Cummins, so to speak holds the 'balance of power'- for the time being anyway. Nevertheless we can be sure that those OEMs, joined in a year or two by let's call it 'Navistar VW', will continue to induce their customers to eschew Cummins power, by means of loss-leader strategic pricing and standard or optional technology packages available only with their in-house engines. It looks distinctly possible that Cummins will eventually feel obliged to follow Caterpillar and withdraw from the North American on-highway market, reduced volumes making its viability questionable. Pricing pressures, for the above reasons, must make Cummins' on-highway engine sales margins far slimmer than those obtaining in its off-highway (construction plant, gen-set, marine etc) business.